NOTE: Made To Order Item... Please Allow Up To 14 Days For Item To Be Made Before I Can Ship this Out... Thank You.. If you or someone you know is or was a cheerleader then this cheerleader Christmas ornament is the perfect gift to give yourself or a friend. Spark some childhood memories for that high school football team you once cheered for. This cheerleader Christmas ornament was cut out of 1/4" Birch plywood by hand (Handmade) using a scroll saw. 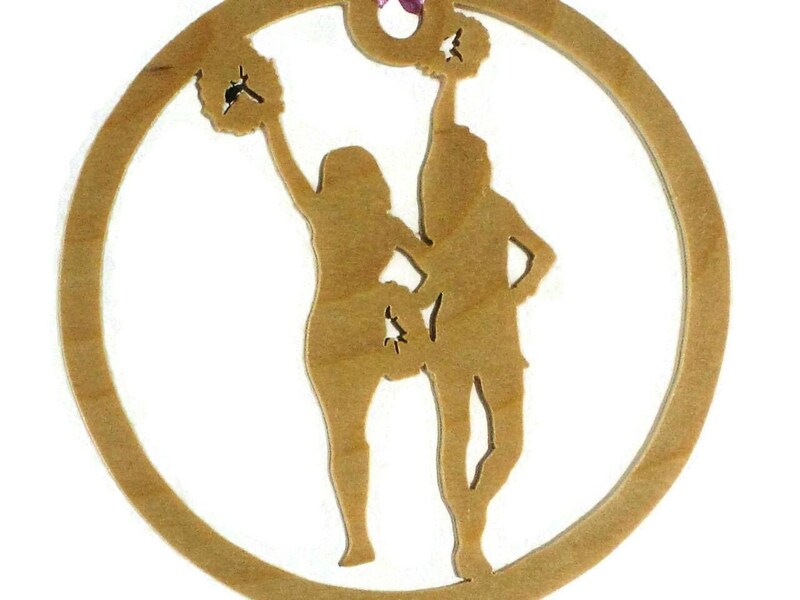 This ornament features two cheerleaders cheering with their pompoms for their football team in a 3-3/4" diameter circular shaped Christmas ornament. A various color fabric ribbon is attached for ease of hanging on your tree. A natural color Danish oil finish was applied to bring out the natural beauty of the wood as well as to protect its natural beauty for many years of memories and enjoyment.